The Indian Institutes of Technology (IITs) are institutions of national importance established through an Act of Parliament. The Indian Institute of Science (IISc) is a premier research and teaching institute established in 1909. The IISc Bangalore & IITs are well known, the world over, for quality education in engineering, science, management and research in frontier areas. The aim of these institutes is to build a sound foundation of knowledge, pursue excellence and enhance creativity in an intellectually stimulating environment. The current pace of advancement of technology needs a coherent back-up of basic science education and research. The vibrant academic ambience and research infrastructure of IISc Bangalore & IITs motivate the students to pursue Research and Development careers in frontier areas of basic sciences as well as interdisciplinary areas of science and technology. Further, IISc and IITs have well equipped modern laboratories, efficient computer networks and state-of-the-art libraries. The teaching process is structured to promote close and continuous contact between the faculty and the students. A number of financial assistantships are available to SC/ST and other deserving and meritorious students at individual institutes. 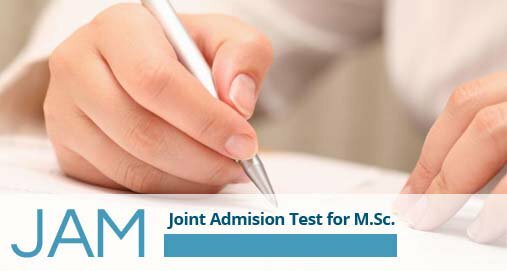 Joint Admission Test for M.Sc. (JAM) is being conducted from 2004 to provide admissions to M.Sc. (Four Semesters), Joint M.Sc.-Ph.D., M.Sc.-Ph.D. Dual Degree, etc. Programmes at the IITs and Integrated Ph.D. Degree Programmes at IISc for consolidating Science as a career option for bright students. These postgraduate programmes at IITs and IISc offer high quality education in their respective disciplines, comparable to the best in the world. The curricula for these programmes are designed to provide opportunities to the students to develop academic talent leading to challenging and rewarding professional life. (h) Requests for the change of category, if any, with proper documentation, should reach the Organizing Institute latest by 10 May 2018. Requests received after this date will not be accepted under any circumstances. (k) In this document, the phrases 'Un-Reserved' and 'General' are used interchangeably and they both mean the same. subject and any 2 subsidiary subjects from Mathematics, Physics and Chemistry. Mathematics/ Statistics as a subject for at least two years/four semesters. B.Sc Degree (3 yr.) with Physics as Honours/ Major/ Main/ Equivalent subject, Mathematics as a subsidiary subject for 2 years/4 semesters and another subsidiary subject from Chemistry, Geology, Electronics, and Statistics for 1 year/ 2 semesters. a) Admit Card, bearing the Candidate's Name, Registration Number, Photograph, Signature and Name(s) and Code(s) of the Test Paper(s) applied along with the Name and Address of the Test Centre allotted, will be available for download from JAM 2018 website from January 9, 2018 till Examination Date. Admit Cards will not be sent by post/E-mail. b) The Candidate should carefully examine the Admit Card for all the entries made therein. In case of any discrepancy, the Candidate should inform the Organizing Chairperson, JAM 2018, IIT Bombay immediately. c) If a candidate is not able to download the Admit Card, then the Chairman JAM of the respective IISc/IITs (See Appendix III of the JAM Brochure), under which the first choice Test City/Town of the candidate falls, may be contacted through Phone/Fax/E-mail, giving the Online Enrolment ID, Name, E-mail ID, Mobile Number, Mailing Address and City Code of the desired Test Centre (first choice) to get information about the Registration Number and the Name of the Test Centre allotted. d) A printout of the downloaded Admit Card must be brought to the test centre along with the original and valid photo identification. Please note that you have to give the details of this ID proof while filling the online application. e) No candidate will be permitted to appear in JAM 2018 examination without a valid Admit Card, and a valid and original ID. f) The Admit Card should be presented to the invigilators/JAM officials for verification. g) The Admit Card of JAM 2018 must be carefully preserved by the Candidate and produced at the time of admission, if required by the Admitting Institute. h) The Organizing Institute may withdraw the permission granted to a candidate to appear in JAM 2018, if it is found that the candidate is not eligible to appear in the exam, even though an Admit Card has been issued and is produced by the candidate before the Presiding Officer of the Test Centre. For each test paper in JAM 2018, an All India Rank (AIR) will be assigned to all the appeared candidates based on the performance of the candidates in the test paper. The candidate with a higher ratio of positive marks to negative marks will be given a higher rank. If this criterion fails to break ties, the candidates concerned will be awarded the same rank. The results (merit lists) will be declared on March 20, 2018 (Tuesday). The results will be available on the website: http://jam.iitb.ac.in. For each test paper, an All India Merit list will be prepared based on AIR. The number of candidates included in the All India Merit List will depend on the total number of seats available in each category(OBC-NCL, SC,ST, and PwD) in a given subject. These candidates (henceforth called Qualified Candidates) are eligible to apply for admission to any of the corresponding academic programmes available (see Appendix-I) at IITs and IISc. Please note that the number of category-wise (OBC-NCL, SC, ST, and PwD) candidates included in the All India Merit List will be based on the category declared by the candidates in their application. 3 B102H64 OLIVIA BARMAN Upload all pages of the certificate in a single scanned pdf file. 4 B103J70 ASHUTOSH VILIN MESHRAM Upload all pages of the certificate in a single scanned pdf file. 5 B105S87 MONALI SUDHIR KHADSE Upload all pages of the certificate in a single scanned pdf file. 12 B103J97 KODAP SONIYA DINKAR Category certificate not uploaded. 19 B116S45 SUKHWINDER KAUR Category certificate uploaded by you is not in English/Hindi. 20 B117C54 DEEPAK KUMAR Category certificate not uploaded. 51 B130A40 SHWETHA.A.N Category certificate uploaded by you is not in English/Hindi. 61 B128N78 SHASHI RANI Category certificate not uploaded. 66 B133E11 KUNAMALLA ANUHYA Category certificate not uploaded. 69 B127A14 HARKAVATH MAHENDAR Category certificate not uploaded.